I love the idea of hot beverages at the holidays and I don’t want to be drinking heavy coffee all day (even though coffee is really a hug in a cup). I also love using whole cinnamon sticks and other whole spices and letting it mull for hours so the house smells delicious. 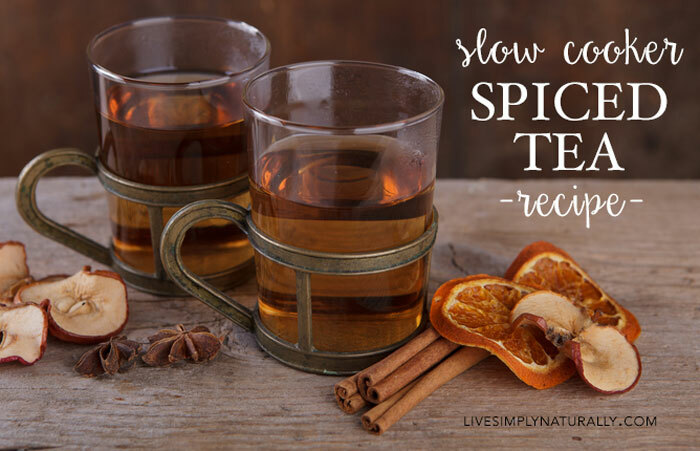 Try this Slow Cooker Spiced Tea Recipe with Apple and Cinnamon for something different from heavy cider or coffee! This spiced tea came out really good, but the first time I made it the taste was too much black tea and not enough apple and spice. So I’ve adjusted it. You can adjust the sweetness to your liking – I generally don’t like things too sweet. Core and seed apples, then slice into thin slices, remove the cores and seeds. Place the slices in slow cooker. Add the rest of ingredients and stir to combine. Turn slow cooker on high for 3 hours. Enjoy while listening to holiday music and eating good food! For more tea recipes, click here! I can almost sell this recipe. I would never have thought to make it in a slow cooker. It sounds wonderful.